When Dorothy’s dog, Toto, hides under a bed during a twister, she follows in an attempt to save him. As a result, both are trapped in the house as it’s carried away by the storm. Dorothy wakes up to find herself in a new land, and discovers that she has just killed a Wicked Witch. She’s a hero to the Munchkins, but Dorothy only wants to go home—and the only person who can help her do that is the Wizard of Oz. As she travels to see the wizard she meets a talking scarecrow, a man made of tin, and a lion who’s afraid of everything, but when they reach the end of the road will they all be able to get what they wish for? L. Frank Baum published the first Oz book in 1900, and it became a success almost immediately. He went on to write 13 more novels in the series, and even produced a stage adaptation of the original book. And we all know that Oz has inspired movies, including one written and directed by Baum and, even more famously, the MGM movie starring Judy Garland. 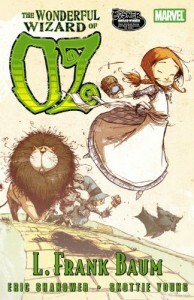 It’s safe to say that The Wonderful Wizard of Oz is universally recognized as a classic novel and a staple of American culture, but Baum’s great aspiration was simply to create an enjoyable story for children: “The Wonderful Wizard of Oz … aspires to being a modernized fairy tale, in which the wonderment and joy are retained and the heart-aches and nightmares are left out.” And that’s just what Baum created. With simple—but still lovely—language, Baum has carried generations of children through his rich, fantastical world full of characters that are entertaining as well as deep and real. Baum’s story is pretty straightforward, but Dorothy and her friends experience a number of adventures both before and after they meet the Wizard (certainly many more than in the MGM film). Shanower and Young manage to find a way to fit all the adventures from Baum’s novel into the comic—but that’s not necessarily a good thing. Dorothy’s three friends are given more room to expand as characters in the side adventures, but in context of the comic, these feel like wasted time. Bits like the Lion jumping a gorge feel unnecessary, taking up little enough time to seem unimportant, but enough page space to disrupt the flow. The comic also fails to escape the problem of using too much of the book’s original narration. Much of it is helpful for establishing the setting, but sometimes the narrative is contradictory to the illustrations, such as when Dorothy and the Scarecrow are described as walking through a “dismal country” while the art shows a bright, friendly-looking forest. Luckily the comic doesn’t rely as heavily on the narration as other, less well-crafted adaptations, such as when we first see Dorothy’s home in Kansas. Baum aptly describes the monotony of the scenery in the original novel: “Dorothy … could see nothing but the great gray prairie on every side … The sun had baked the plowed land into a gray mass … Even the grass was not green, for the sun had burned the tops of the long blades until they were the same gray color …” As imagistic as that prose is, Shanower wisely chooses not to put any of the description in his novel. Instead, Young and colorist Jean-Francois Beaulieu give us a sweeping view of the gray plains with Dorothy in her pink dress as the only spot of color. The art works in favor of the characters as well. Adding his own touches, like a mustache on the Tin Woodman, Young inserts his own vision into the designs rather than simply copying Denslow’s original art or redrawing the actors from the movie. The personality Baum gave his characters shines through, like his roly-poly lion and his viciously cruel Wicked Witch. Young’s illustrations also increase the intensity in some scenes, such as one in which the Scarecrow and Tin Woodman fend off the Wicked Witch’s beasts. Wolves are given bright red eyes, and we see the sketchy shadows of their heads flying as the Woodman chops them apart. A silhouette of the Scarecrow snatches descending crows and crushes their necks. It seems almost impossible to escape the over-narration problem with comic adaptations, at least those of classic novels, but Shanower manages to reduce it enough so that you’re not constantly wincing at artwork clogged with text. Shanower may have also kept a few too many of the off-shooting scenes, but he does offer those with no Oz experience outside the MGM movie a glimpse of the true depths of Baum’s characters. Young’s art is what really makes this adaptation worthwhile. 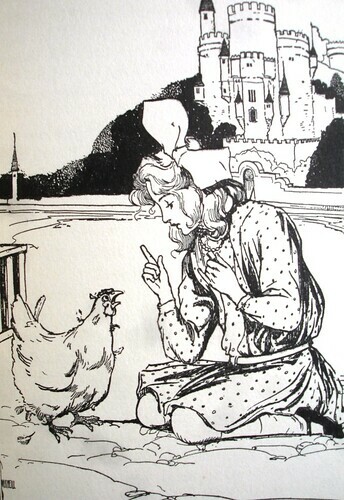 His illustrations enhance the whimsical fairy tale feel of the original book, giving the comic its own life and a leg to stand on amongst the many adaptations Baum’s work inspired. 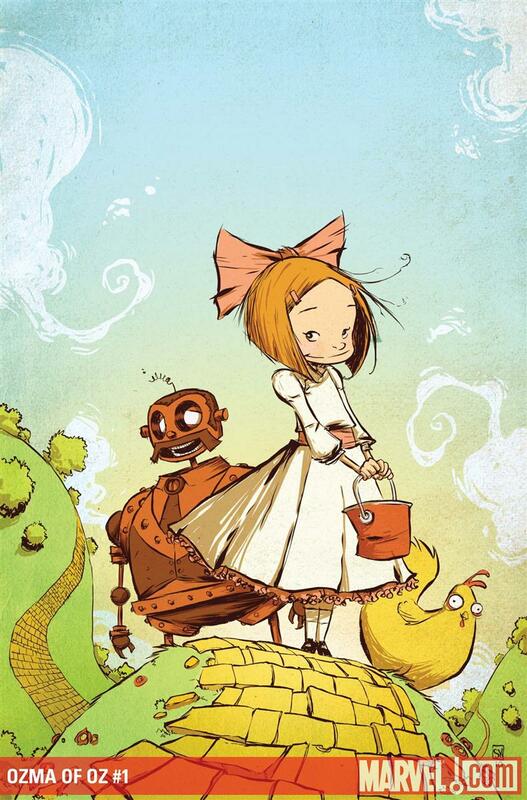 Baum’s book is a classic that all fans of children’s literature should read at some point (I’m ashamed to say I didn’t read it until adulthood), but Shanower and Young’s adaptation is still a fine means for jumping into the world of Oz. Have any graphic novel adaptations you think do a good job? Or a comic you want me to check out for you? Leave suggestions for future columns in the comments! One thing I really love about this adaptation is Skottie Young’s subtle tips of the hat to the illustrations of John R. Neil, who illustrated the Oz books (except for the first one) — something I found indispensable when I read the books as a child. I’ve always thought it was a shame that so many people picture Dorothy as a brunette with braids when *I* knew that she was a blonde girl with a chic Edwardian bob and huge fluffy hairbow. When does she get the hairbow? I’ve never read the other Oz books, but now that I’ve gotten through both of these I really want to. One thing I found interesting in reading this is how much the MGM movie just completely skips over or changes. That is a subject of debate. Many people claim that the Wizard of Oz was originally intended to be a political allegory. The stage version that Baum wrote has some very overt political references; on the other hand, it’s pretty clear that, even if the first novel was intended to be political allegory, when Baum wrote the following novels for children and not as political commentary. Personally, I like the idea of Wizard of Oz as political allegory, as it adds another level to the story. You mention that most graphic novel adaptations of classic novels have an over-narration problem, and as far as western novels/GN, I’ve found that to be generally true as well. But out of all of the Condor Trilogy manhua, I cannot really say that any of them have an over-narration problem. Sure, occasionally they state something that I feel is unnecessary, but not to a greater degree than original comics. Based on the other manhua I have briefly skimmed through which are adapted from classic novels, I am tempted to say that over-narration is not a problem in general for manhua adapted from classic novels, but I really have not read enough to make such a broad statement. Now that I think about it, I think it would be interesting if you reviewed an adaptation that went in the reverse direction – a novel adapted from a comic book. The example which comes to mind (and which I would find very interesting) is Girl Genius – it is originally a comic, but is also now being released as prose novels. Thanks for all the comments! I realize there’s a lo t of debate about what Oz was really about, but I based that statement off of what he says in the introduction to the book. To get into it any further than that would have taken away from the point of the column. Yeah, I was basically talking about western graphic novel adaptations. I’ve never read the Condor Trilogy, but I do want to try to find a greater variety of books to write about here. Out of the manhua that you mention, are there any where both the comic and the original novel are (easily) available in English? You’re right, that would be interesting. I’ll look into Girl Genius, and see if I can find any others like that. Hmmm … if we are restrict it to novels and manhua which are both *legally* available in English, the only examples I can find are the Asiapac English-language editions of Romance of the Three Kingdoms and Water Margin manhua adaptations … which might not be easy to get (I mean the manhua – the novels are easy to get in English), but at least it exists. I swear I’ve seen some manhua adaptation from China of Journey to the West published in English, but I cannot find a trace of it on the internet (likewise, the novel is not hard to get in English). But otherwise, if the novel is legally available in English, the manhua is not (examples: The Fox Volant of Snow Mountain, The Deer and the Cauldron), and if the manhua/comic book is legally available in English, the novel is not (examples: Crouching Tiger Hidden Dragon, The Four Constables). Mind you, expanding this to stuff that is available in English via fan-translation does little to increase the options. 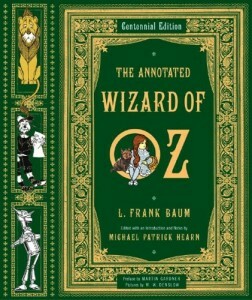 To address the idea brought up in these comments that The Wonderful Wizard of Oz as a political allegory: There is absolutely no evidence from Baum or any of his contemporaries that this was Baum’s intent, while all Baum’s statements about his intent in writing Wizard mention other goals, such as to entertain children. The first time a political allegory was widely mentioned was in the 1960s, Henry Littlefield’s Parable on Populism. Littlefield did not propose that a political allegory was Baum’s intent, but that The Wizard of Oz could be read that way if one so desired. Littlefield later said publicly that he never meant to imply that Baum intended The Wizard of Oz to be a political allegory. But people, primarily in academia, have since accepted political allegory as something Baum intended in The Wizard of Oz. And others after Littlefield have taken it to further extremes in their interpretations. Many people see what they want to see in The WIzard of Oz. The story has been interpreted in quite a variety of ways, some more interesting than others. I have no problem with personal interpretations. But I think that anyone who believes that Baum intended a political subtext to The Wonderful Wizard of Oz, allegorical or otherwise, believes bunk. Thank you so much for the response. It’s always surprising—and nice!—to find out an artist/writer actually read my review. And thanks for the information. Since I was focusing on the content I didn’t delve too deeply into the history, but it’s always interesting to learn these things.